We have some news on Ray, regarding his nocturnal activities! While we know that he is still restless during the night, he has occasionally allowed us a little more sleep. Our neighbor has regularly seen foxes around 2:00 – 3:00am and, a few days ago, they told us that the pair that were regular visitors has grown to three! Those foxes are on the top of our list of possible causes for his restlessness, and the inconsistencies of Ray’s behavior could simply be driven by whether the foxes decide to come close to our property or not. The fact that he has seen a fox when on a walk and totally ignored it, does question this rationale but then … Ray will “hide” if he deems it necessary. “Hiding” is when he wants to pretend that he is busy, and so puts out body language of “I am no threat to you”, “I am currently very pre-occupied”, “Just go about your business”, etc. This was evidenced on one of my first few walks with him in early 2013 when we saw two large German Shepherds (leashed) coming towards us on the other side of the road. (The incident is noted in my book about Ray “Who Said I was up for Adoption?” – see link in right column for more information). From my “first dog perspective”, I was amazed that he did not notice those two dogs as they passed us. A trainer friend explained that he would have, without any doubt whatsoever, known exactly where they were at all times, but he did not want any trouble and so went through his “leave me alone. I’m busy” routine! Not wishing to overlook some other potential causes for his night time restlessness, we changed giving him his anti-anxiety meds from dinner-time, to breakfast, and there was some improvement, but it was temporary. Earlier this week we took him to see his favorite vet (who gave him a brief examination – nothing obviously wrong!) but, apparently, there is a slight chance (extremely slight) that the meds which have been helping him to stay calm (full story is also in his book), could now be working against him. We have decided to try and wean him off them and see if they are necessary now. He started his first reduced dosage yesterday, and there are no symptoms of any problems as a result but, to be realistic, it will take him 4-6 weeks to totally adjust to this new dosage. It feels good to catch up on Ray and I hope he gets more peaceful nights ahead – fox or no fox. I am hoping it is just a meds and there comes a point where he is completely off them! How do you explain medicine to a dog?? P.S. on a totally unrelated note, where exactly are you based in Canada? I don’t suppose Ray even knows he is on meds as we bury his pills in pumpkin pulp (which he loves)! Re your question – We’re just West of Toronto (S.Ontario). My bet would be that he no longer needs the meds. I hope I’m right. I’d like to suggest that you try some natural bach-flower based sprays for Ray at night that wouldn’t interfere with his meds. Have a look at what Blackwing Farms in California produces – I was introduced to this product range by the trainers at Best Friends Animal Society and have begun to import them to New Zealand. Also, a Traditional Chinese Medicine analysis would also help to classify his constitution and address possible natural remedies and herbs for support. I can help with that, if needed. I consult using Skype. We are accumulating quite a list of potential alternatives, and really appreciate your input. Our first step however, is to slowly reduce his meds. We would obviously like to get him med free but, if that is not possible, we will be considering alternatives … but we’re not at that point yet. And reading the book is a real pleasure as well! It makes me very happy to know that my story of Ray and I was a pleasure to read. Thanks Rae. I think I must also adopt Ray’s “leave me alone, I’m busy” more often. It can save me a lot of trouble. My best to Ray and I hope that the insomnia problem will be solved soon. Well it does seem to be an effective “problem avoidance technique” doesn’t it! Glad to read that you may at last be getting some answers! I would say that the meds are very likely. I wasn’t thinking about Ray being on meds when I read about the problem or the thought may had occurred to me. I had the similar experience. Meds that I have been taking for my heart used to make me tired at night. Then I started having problems with insomnia. The Dr said after being on the meds so long they can start having the reverse affect. I hope that weaning Ray off the meds helps to relax him again. It will certainly be interesting to see his behavior as his dosage decreases. He could become much more playful, but of course he could become more wary/less friendly. We shall soon know! That is obviously our hope also, but one must be prepared for other possibilities. Yes you are right and I know Ray is in good hands as you work out what is best for him. Wish all of you the best and hope that Ray will live good without medication. My totally uneducated guess is that it is the meds. Maybe good to get him off of them anyway especially if there is any effect on his liver (? )… CBD oil has shown good effect on reducing anxiety in dogs, as well as a host of other benefits. I suggest looking into it. Either way, good luck in solving this mystery and getting a full nights rest. Glad to hear you may be making progress with the night interruptions. Perhaps Ray hears the foxes but being unable to see whatever is disturbing him, so he wants to investigate. This was a very good part of the book (one of MANY good parts!) I enjoyed reading it again. I think that I had a huge advantage over many dog owners, in that Ray was my first dog … so I knew nothing! When you can acknowledge that you know nothing, you are very receptive to asking questions and listening to the answers! I have learned so much about Ray, and have also learned that so much may not apply to another dog. They are, like us, complex creatures and most certainly a product of both their genetic background and their life experiences. 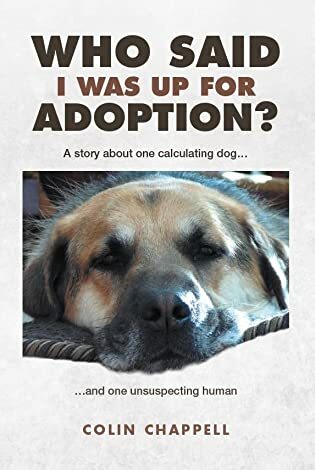 It was a real pleasure writing “Who Said I was up for Adoption?” and just share the experience of having a “shelter dog” in my life!